Neukleos is the Official Technology Partner for ART X Lagos. 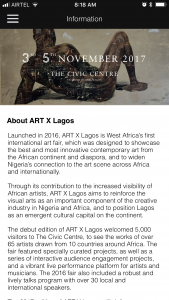 The ART X Lagos app is an intuitive, elegant and seamless application designed to global standards. 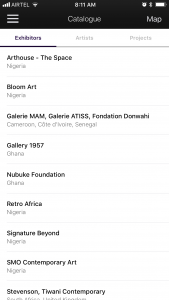 Following the first release of the app for the leading Art Fair in Nigeria, the product has achieved improvements in utilizing available technologies and tackling the biggest issues encountered with the first release. We aimed to create a product in line with global standards and comparable to the very best in the Art’s fair space. 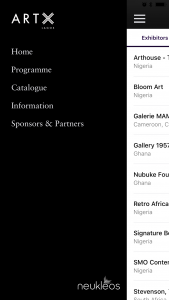 The ART X Lagos app has a catalogue of the exhibition which helps to document the fair in an easy, and continuously accessible way. We also include an interactive exhibition map which is useful in hassle-free location of exhibition booths and with cognisance to the obvious fact that our mobile devices are a part of our modern lives, going everywhere we go, this assumption holds true. With these and more, we constantly aim to create solutions at the interface of human need, technology and marketing with the aim of solving problems, far-reaching beyond fads and trends. Neukleos creates well thought up solutions channelled across mobile, analytics, artificial intelligence, machine learning, multi-location technology and more. We could write a thesis on the possibilities of each of these technologies in impacting the average business from SMEs to large multinationals, but we will rather focus on the relatable experiences we have been involved with in 2017. Optimised Marketing and communications using Machine Learning and Artificial intelligence. 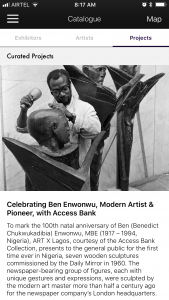 For a large Nigerian bank, we were aware of the huge amount expended in communication and marketing of a particular product, but despite these efforts, the right amount of conversion was not yielded per spend. At that point, we proffered a solution based on existing systems to reverse the trend and yield profitability by inferencing user needs, requirements and experiences, in selling the product through the most appropriate communication channel per customer need. Back in 2007, people’s relationship with sporting events were completely different. Today, expectations and deliverables have moved with the times and available technologies globally, unfortunately most brands locally are yet to utilize the gains. We came in to help reposition a brand beyond being just an event sponsor, to participating in the events well before the event takes place, thus generating conversations, building momentum and brand loyalty and achieving more than could have achieved in the span of the single-day held event. The result is a story of empowering people, driving growth and focusing on all the benefits that being connected can bring. Delivering Return on Investment for advertisers by effectively monitoring and triggering 2nd screen experiences in a measurable and engaging way. At Neukleos, we believe that how people experience their world (brands, products and services) should be seamless and brilliantly designed. Some of the best stories come from empowering people to change their circumstances through technology; whether it’s a community based project of managing verifiable funds, or revolutionizing a sector through unified communications and databases. Neukleos is achieving big strides with these by investing in the right people, technology and solutions to make processes simpler and life easier.